Sinewave Cycles will be exhibiting this week at Interbike in Las Vegas. We'll be in booth 24211 with Advocate Cycles, and co-displaying with Shutter Precision dynamo hubs. If you're at the show be sure to drop by! The Reactor is on Outside Magazine's very short list of NAHBS highlights! Note that the Reactor works with all dynamo hubs. The article mistakenly says "virtually all dynamo hubs". We had a great time exhibiting at the North American Handmade Bicycle Show (NAHBS) in Louisville this past weekend. The show was March 6-8, although we hit the road Wednesday morning (March 4) and finally returned on Tuesday night (March 10). Quite the journey. and Dave explaining the Reactor and Revolution on YouTube! Some more articles should be available soon, we'll add links as the stories appear. And nice to see a Reactor in the Co-Motion booth. It's available as part of their Pathfinder package - a SON28 dynamo, Edelux II headlight, and Reactor charger! The most common question I have received is in regards to the front dynohub and how I charge my electrical gear. I use a Son Schmidt Dynohub which powers my front headlight and was also conected to the Sinewave Revolution USB charger and the PowerGen 12000Mha Battery. With this combination and when cycling at speeds of about 15km/h it charges my phone at the same speed as mains power. When traveling slower it still charges ok but not as quick. When I’m not charging my phone directly I charge a PowerGen 12000Mha battery, I use this to charge up my GPS every night as well as all my other USB devices such as my Kindle, headlamp, steripen, etc. I charge my computer off mains power as I travel. Places such as fast food restaurants, coffee shops, RVers who let me charge on their power etc. I started this tour with the Pedalpower plus system. It was poor quality and continually failed me, I was not overly impressed. So far, after about 9000km the Sinewave Revolution has exceeded my expectations. I am very happy. The PowerGen battery is just a cheap battery I bought on EBay, it works fine and holds more than enough charge for extended cycle touring when used in combination with the Sinewave Revolution. I’m a big fan of bike touring and commuting, and I hate having to rely on others, outside equipment, and general mooching. This includes searching for electrical outlets at lunch stops, paying extra for electric hook ups at campgrounds, and carrying pounds of extra batteries when on a tour. Another thing I’m a big fan of? Dynamo power! 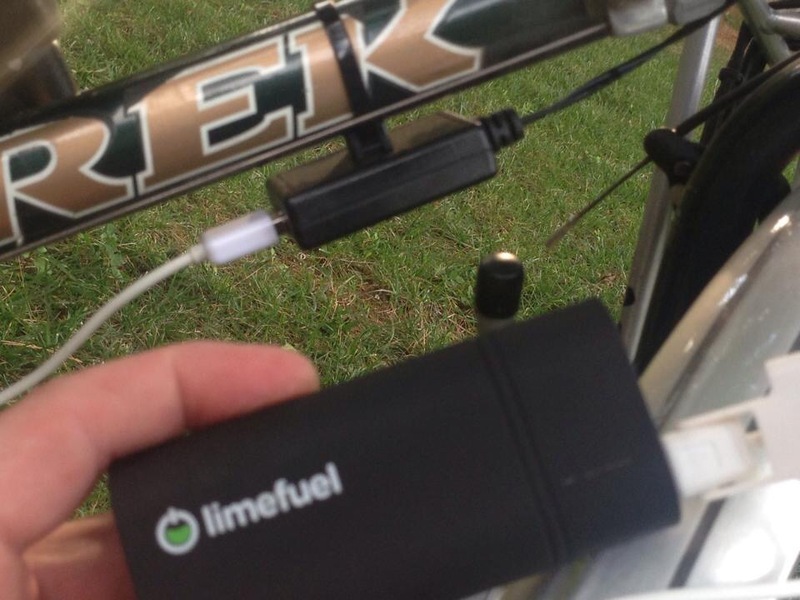 The only thing better than powering forward on a bicycle is using that power to juice up your essential gadgets. In 2010 I discovered modern dynamo power in the form of a SON Dynamo hub. 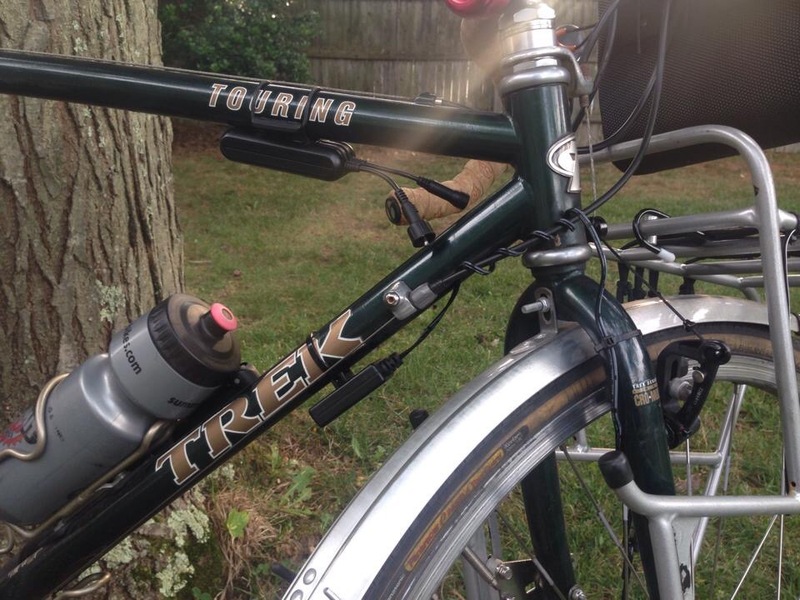 I had a wheel built up with a Salsa Delgado rim to the dynamo, with the express purpose of using it on my touring bike in the summer and my commuter the rest of the time. Right away I purchased a dynamo powered headlight and the Busch and Muller e-werk charger. Long story short, in 2013 it was time for an upgrade. As technology has evolved, just about everything can be charged via USB. There are a few products on the market that are ideal for cycle tourists. Personally, I need to be able to charge my iPhone, iPad Mini, Garmin Edge 705 GPS, and a few rechargeable headlights and tail lights. Two ideal products for charging all of these and more are the “Revolution”, by SineWave Cycles of Cambridge, MA, and the USB-Werk, made by Busch & Muller and available in the U.S. from Peter White Cycles in New Hampshire. Both devices are designed to harness the power of a dynamo hub to charge USB devices. Ordering each of these is easy. Order online from SineWave’s website, or from Peter White’s. Your LBS can also obtain these for you. But, out of the box, there are a couple key differences. The Revolution does not have any connections for dynamo hubs included. You are to purchase the little connectors for Shimano or SON separately, then connect them. The USB-Werk includes connectors for both Shimano and SON, so everything is right there. This is kind of an important point, as I didn’t know that the Revolution didn’t include the actual connectors for the hub. I had extras, so no big deal, but if you need a Shimano connector and wait to order this until the last minute before a tour, you’re sunk. Point goes to B&M here. The USB-Werk comes with a huge assortment of connection options. Cords for everything: micros usb, male to female usb, iPhone (old and new), etc. The Revolution simply has a regular usb input as part of the device, so you can plug any regular usb cord into it. Equal points for both devices here. I am not an electrician. I’m an avid cyclists, pretty self-sufficient, and a heckuva bike mechanic. I am pretty dumb when it comes to wiring, amps, volts, even polarity. The B&M comes with a multi-page booklet that assumes a base knowledge of electronics and wiring (perhaps this is core-curriculum in Germany?) So even though it comes with an instruction manual, I didn’t find it very helpful. The Revolution comes with virtually no instructions, which in some ways is even clearer. So neither product gets extra points here. Both are pretty even, and neither is great. Both could come with a “how to wire this device and not fry your gadgets” manual for dummies like me. Even score. I took a little time to create a “first ride” video for the revolution. You’ll see there that I have not directly plugged a fancy device into my Revolution. Rather, I have a Lime Fuel external battery with “pass through” charging plugged into the device, then my iPhone plugged into the battery. This is a safeguard. I’m paranoid about frying an expensive device, so this method serves two purposes. If something goes wrong, I’m more likely to fry a $30 external battery than a phone or gps worth hundreds. Additionally, when I’m done riding for the day, I have a fully-charged extra battery that I can use to charge up another device. This is especially helpful as many GPS units and lights do not operate while plugged in. Charge the phone and battery while riding, then charge the other device from the battery while in camp. Win/win. Both dynamo chargers can do this. So it’s easy. Plug your device into your charger and ride. You’ll get a steady trickle of juice. I will say that the logistics of actually having things plugged in and cords strewn about the front of your bike can be tricky. You’ll need either a handlebar bag or frame bag to store your device, and be careful to route wires so they don’t snag on anything or mess up your steering. While both devices claim waterproof properties, let’s face it – you’re hooking up expensive electronic devices to USB inputs out in the elements. I’m too chicken to actually try to charge something in the rain. I can say, however, that the charging units themselves have stood up to rain, snow, sleet, and general wear and tear with no problems. I have about 2000 miles on these units this season. While I never made it on an extended week-long tour, I did use both on many commutes and day tours. I love the ease of being able to ride long distances without having to charge anything, and the knowledge that I can ride all day, then charge stuff up around the campsite. I LOVE the simplicity of the Revolution. Hook it up, then plug your stuff in and go. That’s it. I also love its size. It’s a bit smaller than the B&M, and it tucks nicely out of the way. In my case, I have it mounted under the downtube. The USB-Werk comes with everything you need and more. I like that it comes with a variety of connectors, and that it came with options to connect with different brands of dynamo hubs. As a person who has worked in bicycle shops off and on for more than 25 years, I’m big on accessible and understandable customer service. While Busch and Muller is a reliable company with a sterling reputation, and Peter White Cycles is a great resource, you just can’t beat being able to actually communicate with a product’s inventor. Such is the case with SineWave. I sent an email to the company, asking a few questions about the product, and received a detailed reply from the president of the company. What?? Yeah, that was cool. He IS an electrical engineer, and a touring cyclist, so he gets it. So my verdict is to buy the Revolution. It’s a great, simple, effective product, and you just can’t beat the customer service that backs it up. Ride hard, ride safe, and remember that a clean bike is a happy bike! My Revolution has been mostly used with a Schmidt SONdelux dynamo and Anker mini lipstick sized external battery, with pass through charging, in conjunction with an Edelux II headlight which is piggybacked onto the Revolution. I have also used the Revolution with Schmidt SON 28 and wide body SONdelux dynamos. I have not found any practical difference in using the Revolution on these three models of Schmidt dynamos. I was concerned that the SONdelux might not have enough power output to charge and use the light at the same time based on information from Peter White, the US distributor for Schmidt. However, the SONdelux did just fine powering both the Edelux II and Revolution at the same time, even when climbing, throughout the 2200 brevet in Italy and on a prior 1000 km brevet. I was also concerned that the wide body SONdelux might not allow for enough room between the hub and fork for the piggyback connector set; however, I used a wide body hub on the 1000 km event and this was not a problem. I do recommend using an external battery and pass through charging in conjunction with the Revolution for two reasons. First, the Garmin 800 has visual and audible warnings when an external power source turns off. When one stops or slows down below the power output threshold these warnings are activated which is both annoying and distracting. Pass through charging eliminates this issue. Second, it's nice to have a fully or mostly charged external battery ready to go at all times if a smartphone or other USB charged device needs juice when the bike is not moving. The Revolution has gold plated contacts and is sealed in epoxy so water is not a problem with the charger itself - although getting the Garmin's connection contacts or innards wet is a concern. The same concern applies to external batteries. 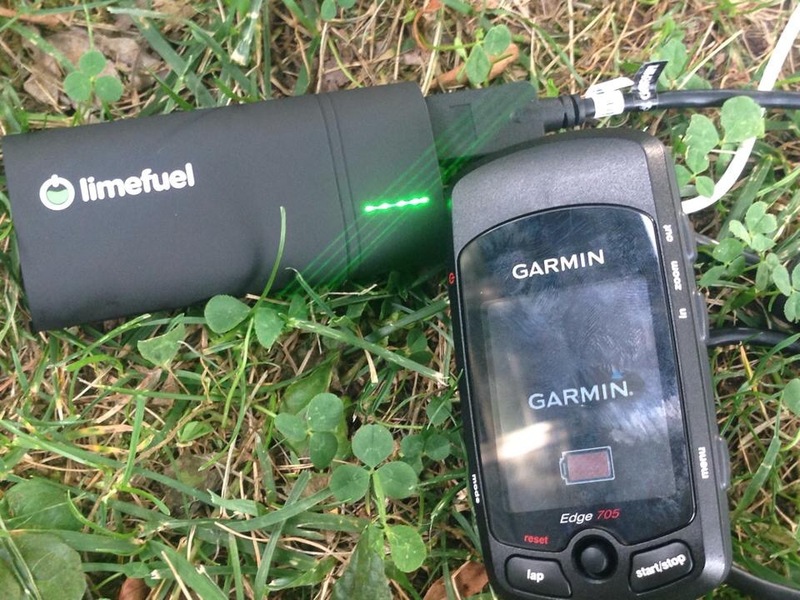 The work around is to disconnect the Revolution and external battery from the Garmin during periods of heavy rain and hope the rain stops before the Garmin's charge is depleted. I'm currently having a custom vinyl cover made that will act as a type of protective awning and attach to my handlebar bag. Time will tell how that works out. Another rain option is to carry a back-up Garmin for the all day and night type of prolonged downpours. There were only a few downpours on the 2200 km brevet and I only had to disconnect power a few times, for a few hours or less each time, in order to keep the Garmin completely sealed up and dry. However, the Revolution USB charger itself will not fail when wet. The Revolution performed flawlessly throughout the 2200 km brevet which was completed in just under 7.5 days. The event was long and hard and it was totally sweet to not have any GPS or phone charging worries. As such, the Sinewave Revolution USB charger gets my highest recommendation. A few weeks ago we shipped the first handful of Reactors and we've received our first feedback from the road! One user already relied on theirs in the Oregon Outback - quite a testament as this 360-mile bikepacking ride is fully self supported and a failed charger would quickly leave you without a phone or GPS. Dynamo, aka “generator,” hubs are a great way to power bicycle electronics. You never have to worry about carrying spare batteries for your lights, and if paired with a dynamo USB charger, you’ll never have to worry about keeping your smartphone/GPS charged. The problem I’ve found with dynamo USB chargers, though, is that the reliable models are not modestly priced, and the modestly priced models are not reliable. Enter Sinewave Cycles (formerly Brite-Bike Labs) of Cambridge, Mass. At the Philadelphia Bicycle Expo, I was lucky enough to meet Dave Dean, the resident electrical engineer at Sinewave. I told him about the frustrations I had with the effectiveness (rather, lack thereof) of low-priced USB chargers, and then he told me about the Revolution. It’s a no-frills dynamo USB charger that is as functionally effective as it is solidly built, all at a very reasonable price. My old USB charger struggled to charge my phone, even with the wireless network disabled; the Revolution boasted “best in class” efficiency. My old USB charger burned out on a long downhill (Rabbit Ears Pass); the Revolution has high speed overload protection. My old USB charger was corroded after a few rainy rides; the Revolution has a gold-plated USB connector so it won’t corrode, and it’s 100% waterproof, so rain is no issue. On top of all that, it also has a one-year warranty on materials and manufacturing. We were in Charlotte, NC this past weekend at the North American Handmade Bicycle Show. We had a great time showing off the Revolution and announcing our new charger, the Reactor, which is now open for pre-orders. Check out this article written by Gizmag!